The Ohio eviction notice forms are used to let a tenant know that they must cure a problem, such as pay all the rent due, or vacate the premises in three days. There are also 30 day notices in the event of a health or safety violation or when a month-to-month tenancy is over. If the tenant fails to respond in the manner provided, the landlord may then go to the Municipal or County Court where the property is located to file an eviction complaint. Each court has its Own Forms (View Sample Complaint). Once the landlord has filed the Complaint and paid the filing fee, the court will issue a summons to the tenant to appear in court. If the court finds in landlord’s favor, they will issue a Writ of Restitution (See Sample) giving tenant a certain number of days to vacate. 3-Day Notice to Quit (Non-Payment of Rent) – Use this form when your tenant has failed to pay rent when it is due. The tenant will have three days to respond before you can proceed with an eviction action. 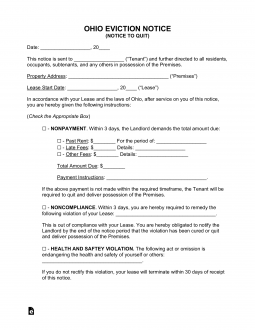 3-Day Notice to Quit (Non-Compliance) – Use this form when your tenant is violating a lease term, other than not paying rent. The tenant will have three days to respond. 30-Day Notice to Quit (Health or Safety Violation) – Use this form to let your tenant know that they are creating a health or safety violation and they will need to fix the problem or vacate the premises. 30-Day Notice to Quit (Month to Month Tenancy) – Use this form to inform a party that you will not be renewing a month-to-month tenancy. Your lease will tell you when your rent is due. If it is not paid by that date, it is considered late and the landlord will be able to send you a three day notice to pay or vacate. Step 2 – If the tenant does not move or cure the problem within the time period allowed, a landlord may go the next step by going to the Local Municipal or County Court and obtaining a Complaint. In Ohio, each court has its own form and process, so it is important that you ascertain what the requirements are for the court you are in. View the Sample Ohio Complaint Form. Step 3 – Once you have filed a complaint, the court will issue a Summons and a copy of the Complaint to the tenant. The tenant will have a minimum of seven days from receipt of the Summons to respond and file the Answer (See Sample). Step 4 – The landlord should make sure to have copies of the notice, evidence that it was delivered as well as copies of documents that show the breach by the tenant. If tenant does not show up when instructed and/or the judge finds in favor of the landlord, the court will issue a Writ of Restitution (See Sample) which gives the tenant a certain number of days to vacate. Locate the Lease you are sending a Notice about. This document will contain information that will be called for on the Notice you wish to send. When reporting such information on the Notice, keep in mind, it must be presented exactly as it is reported in the Lease. Secure the correct form by selecting the “PDF,” “ODT,” or “Word” button on this page. This form may be filled out on screen with the program appropriate to the file extension or you may print it then fill it out. Locate the title “Ohio Notice To Quit” then, enter the Full Name of the targeted Recipient(s) on the blank line beneath it. In the first sentence, record the City, County, Zip Code, Building/Street, and Apartment Number of the Rented Property related to this notification. In the second sentence, record the Day, Month, and Year of the Signature Date displayed on the Lease. The Notice Statement applying to this document must be selected by the issuer of this Notice at this point. There will be several statements that you may select from to explain the purpose of this Notice. A Nonpayment Notification issued by the Landlord to the Tenant will give the Tenant Three Days to pay a specific Amount of Money or return the premises to the Landlord or Landlord Agent. The blank spaces in this statement will require the Identity of the Authorized Agent, Total Amount of Money owed by the Recipient, the Minimum Amount of Money that must be remitted, and the Rental Period that must be paid for in order for the Recipient to be allowed to stay. A Noncompliance Notification issued by the Landlord to the Tenant will give the Tenant Three Days to fully comply with the conditions of the Lease and to remedy an effective rectification to the violation has committed or surrender the premises. Describe the violation in the space provided. A Health/Safety Issue Notification issued by the Landlord to the Tenant will give the Tenant Thirty Days to completely cure a violation of Ohio Revised Code § 5321.11 or return the Property to the Landlord. Make sure to fully describe the Health/Safety Issue in the space provided. A Month to Month Tenancy Notification issued by the Landlord to the Tenant will inform the Tenant he or she has (at least) Thirty Days to surrender the Leased Property. This will be the result of ending a Monthly Rental Agreement. The last Date this agreement is valid for must be reported in this statement and must be at least Thirty Days after the net Payment Date required for Rent. A Month to Month Tenancy Notification issued by the Tenant to the Landlord will present the last Date the Tenant intends retain the Property. That is, the Tenant will quit and turn possession of the Property over to the Landlord, effectively ending the Month to Month Rental Agreement held. This Date must be Thirty or More Days after the Landlord receives this document (and after the next Rent Bill Due Date) and must be recorded using the spaces in this sentence. Locate the words “Certificate of Service.” Beneath these words, the individual serving the documents to the recipient must enter the Day, Month, and Year he or she released this paperwork and the Identity (Full Name) of the person this paperwork was released to. After establishing these facts, the Deliverer will then convey how the paperwork was delivered by selecting one of the Delivery Statement check boxes. These offer a validation for delivering directly to the intended Addressee, delivering it to a second party who gives reliable assurance this paperwork will be delivered, or that it was mailed using First Class USPS Mail.